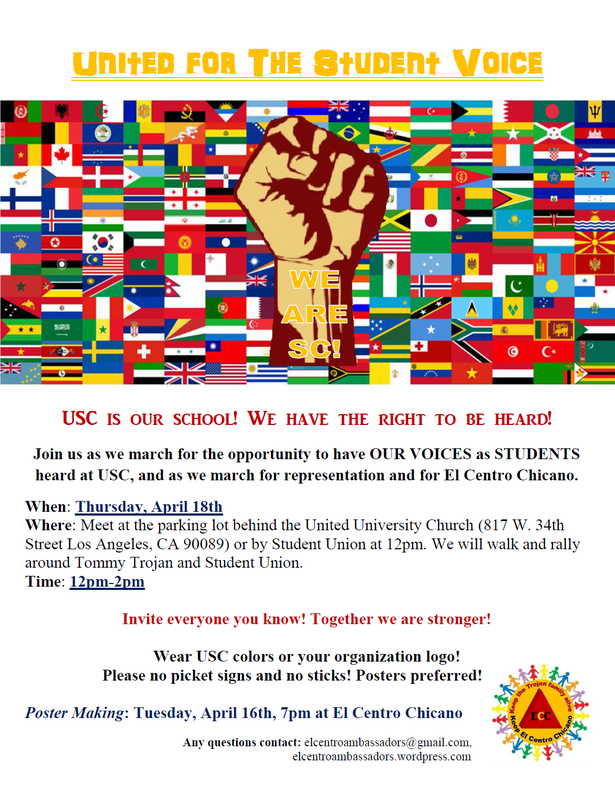 Come Out to the Rally this Thursday!!!! The time is now. We must act. We will see you at the following events. Invite friends, family, etc.! The more the better! 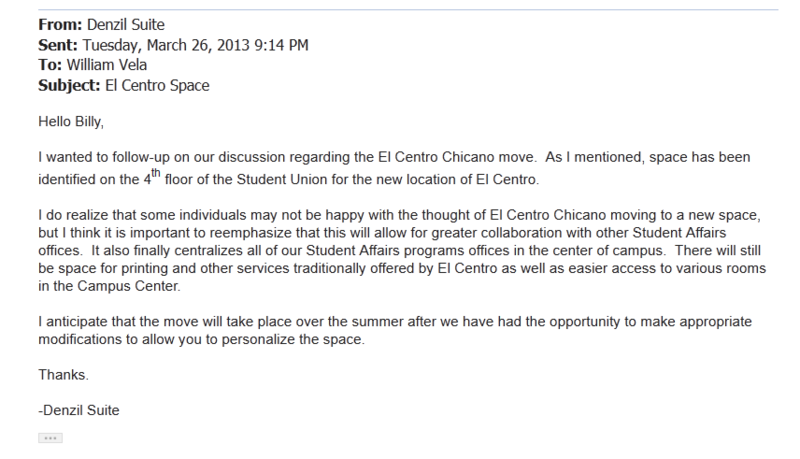 We have been informed that the administration has made a decision to move El Centro Chicano to the 4th floor of the Student Union. They did not take their time to listen to the concerns of the students and the community, and they did not consider discussing with us the relocation. The message sent my Denzil Suite, the VP of Student Affairs, regarding the move is attached below. We will have an EMERGENCY MEETING this MONDAY, APRIL 1st at 7PM at El Centro Chicano to discuss the details of the relocation and what our next steps will be in stopping the relocation. We will see you all on MONDAY! There will be a meeting this Monday the 25th at 7PM at El Centro Chicano. We’re waiting for a response from administration regarding the packet of data that specified the use of El Centro’s space by students and organizations. In the meantime, we’re asking students, faculty, alum, parents, community leaders, and supporters to write a letter of support and send it to President Nikias. You can help by SPREADING THE WORD and WRITING your own letters. Letter templates and further instructions, including email addresses, can be found here. Feel free to write your own version and add in your own stories on why El Centro is important to you. To increase the impact, we hope to have most letters sent by April 1st – April 4th! To spread the message regarding the letter campaign, there are flyers/banners that can be used. 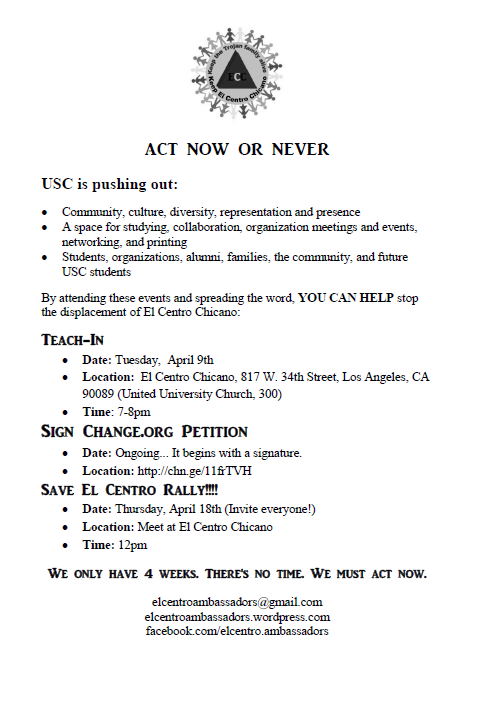 There will be a meeting Monday, March 18th at 6:30PM at El Centro Chicano. If you will like to attend the meeting but cannot, please message us at elcentroambassadors@gmail.com.